Decorative Life: From 7-11 days, the former in water and the latter in flower food solution. Rather susceptible to the root attacking fungal organism, Phytophthora. Member of the Euphorbiaceae (spurge) family. Related species include poinsettia, crown-of-thorns, rubber tree. Leaves are oval, bright green with white margins, upper leaves sometimes all white. Stems leafy, 12-24 inches long. Plant is an annual, classed as a dicotyledon, leaves not parallel veined. Named after Euphorbus, the physician to the king of Mauritania, Juba. Grows on the plains from MN to CO and TX. In addition to the many ornamental species in this family, others yield rubber, edible fruits and roots and have valuable medicinal properties. 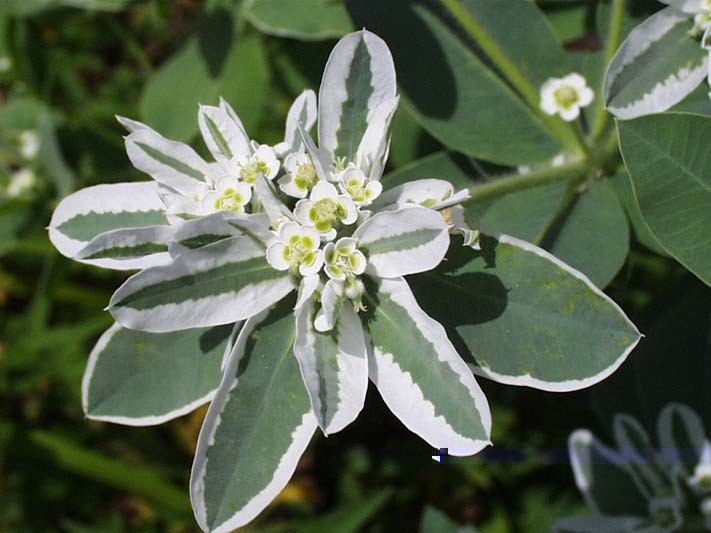 Many Euphorbia species have been shown to cause dermatitis related problems with some individuals but the precise potential reactions (if any) from this species have not been located to date in the literature.